Pricing and specification has been announced for the new Mercedes-Benz Sprinter AWD. The new Sprinter is now available to order for March 2019 production, priced from £37,540 excluding VAT for the Sprinter 314 Chassis L2 AWD. The Sprinter AWD uses the Mercedes-Benz 4-ETS (Electronic Traction System) technology, which is integrated with Adaptive ESP. 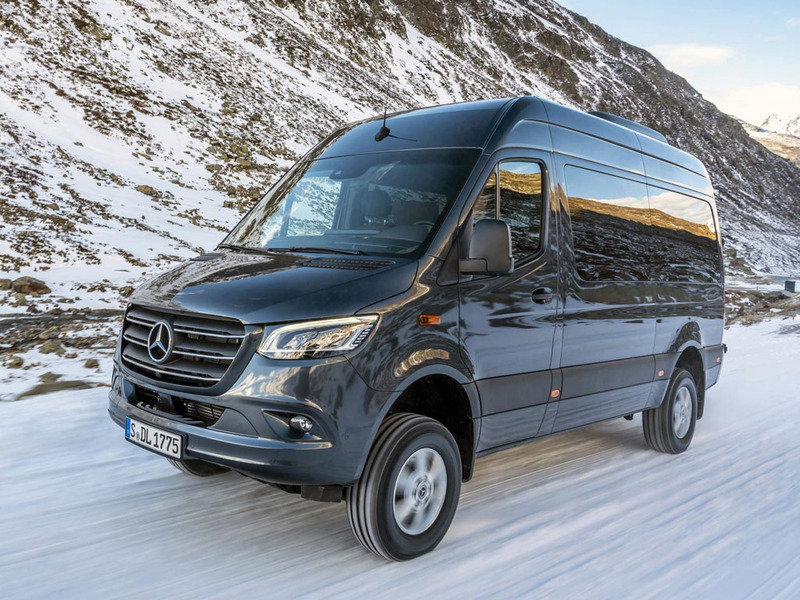 The Sprinter AWD features selectable low range transmission and Downhill Speed Regulation, increasing the climbing ability of the vehicle and making it ideal on rough terrain. The AWD system is turned on and off electro-hydraulically, enabling the system to be engaged (4×4) or disengaged (4×2) in vehicle speeds of up to 6 mph if conditions demand. The system is operated by a dashboard mounted rocker switch with integrated indicator lights to show selection and full engagement. In addition, the vehicle uses an electronic rather than manual diff-lock. In all-wheel-drive mode, the transfer case sends 35% of the power to the front axle and 65% to the rear axle. With low range engaged torque is increased by around 40%. In addition to the low range gear selection and Downhill Speed Regulation, enhanced standard specification for the Sprinter AWD above a standard 4×2 Sprinter includes entrance grab handles on both front doors, hydraulic steering, and mixed use mud and slush tyres. The AWD Sprinter models use a fully developed and integrated factory assembled driveline and are built alongside 4×2 models; they are not aftermarket conversions and are covered by full three year, unlimited mileage Mercedes-Benz Warranty and supported by the nationwide Dealer Network.